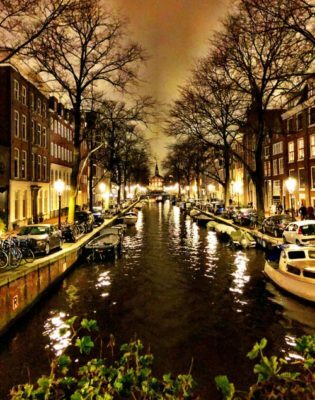 My first trip to Amsterdam was in 2011, my final stop on a 30-day, 9 city tour of the world that started in Beijing before weaving through Southeast Asia, Istanbul, Paris, and Brussels before depositing me in one final foreign city. 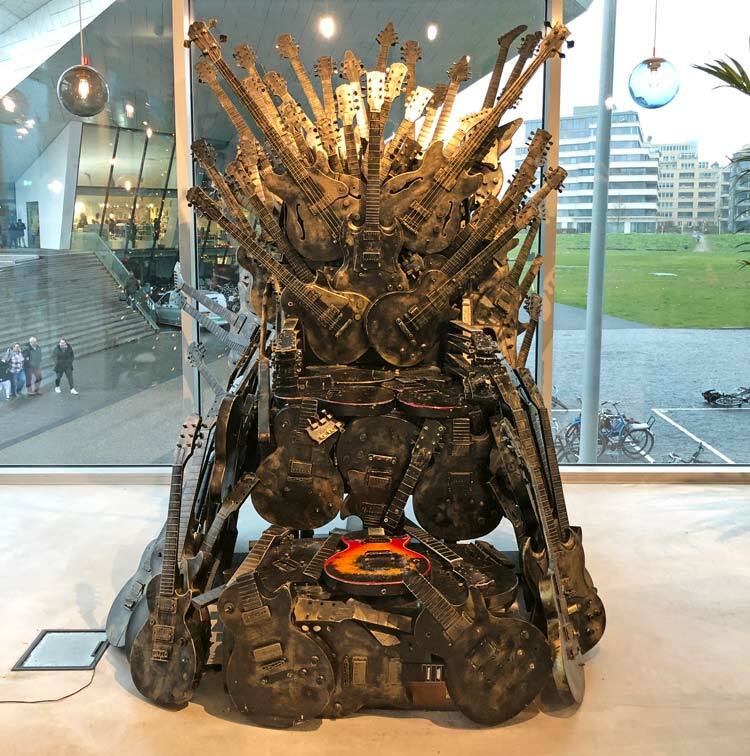 I arrived in Amsterdam weary and ready to return back to the USA; four weeks of alternating between work and play, cold convention centers and humid ancient ruins had me second guessing why I added extra time after my conference in Paris ended. Even lying on the bed in my final hotel I considered staying put for a few days, waiting it out until my flight home and keeping the loneliness that sometimes accompanies solo travel at bay just a little while longer. But I rallied, laced up my sneakers yet again, and discovered my final stop would also rank among my favorites. Amsterdam welcomed me with great food, sightseeing, and friendly people; when it came time to leave I was sorry to go so soon. When Adam mentioned he really wanted to see Amsterdam—and when we made plans to spend New Year’s Eve in close-by Bruges, Belgium—I couldn’t wait to see if the city would exceed my expectations yet again. Amsterdam is an ideal place to spend a quick city break or a whole week, and there’s more than enough to see, do, and eat to keep you entertained for as long as your vacation time allows. 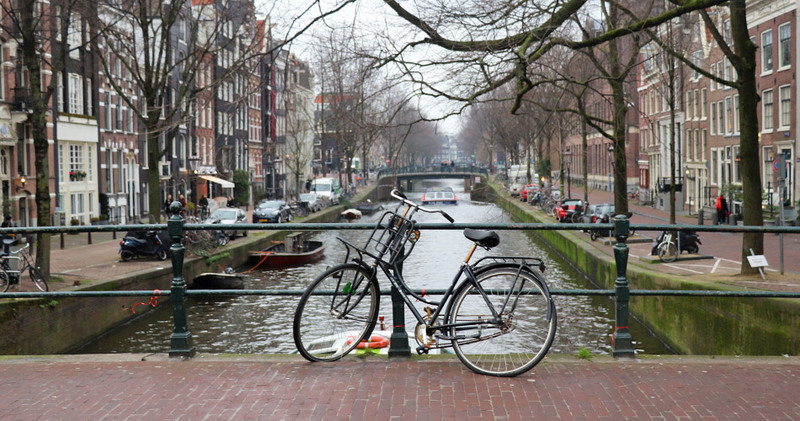 Here are 15 things we highly recommend for anyone planning to visit Amsterdam. We are big fans of free city tours, and we have taken (and loved!) them in cities around the world. Fresh off our red eye flight from the USA we checked into our hotel and walked to Dam Square, the meeting point for a number of free walking tours. 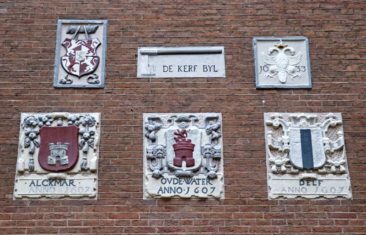 While it isn’t always compulsory to book a walking tour in advance, many of the companies that operate in Amsterdam recommend that you fill out an online form so they know to expect you. Most tours try to keep groups small to avoid crowding the streets and to offer a more pleasant experience, and they determine the number of guides they will have available based on the number of people who preregister. Still, if you don’t make arrangements in advance and simply show up onsite most companies will do their best to accommodate you. 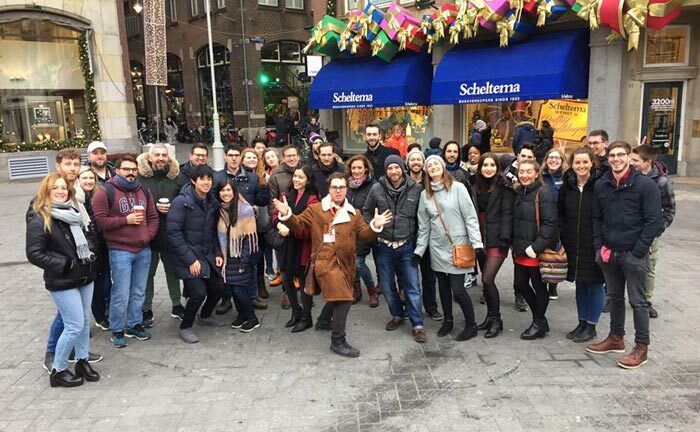 We browsed the itineraries offered by a few free tours before selecting Sandeman’s, which offered a 3-hour walking tour and information delving into many aspects of Amsterdam’s history and culture. Our guide, David, shared some fun stories and was very talented at engaging the big group of tourists who joined us during our walk. 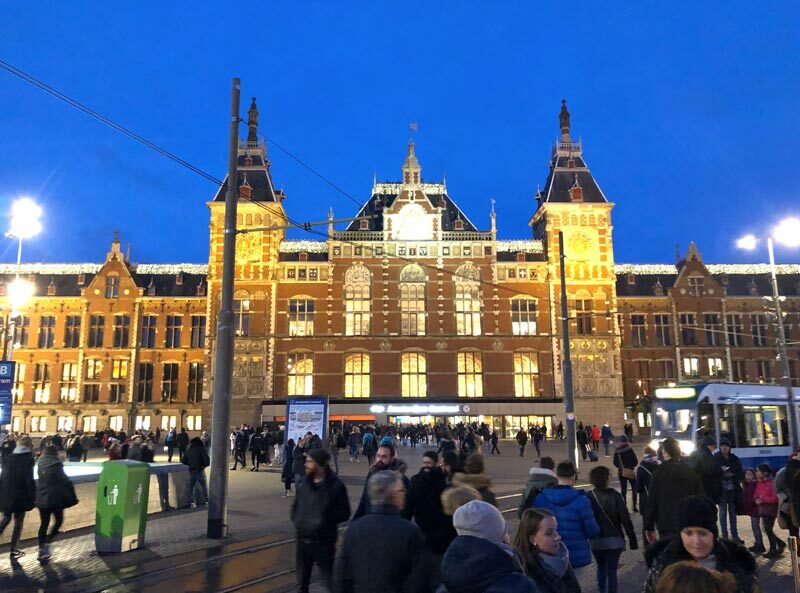 For Adam, a first-time visitor to Amsterdam, the tour was a great way to get his bearings and introduce him to the city’s relevance and major attractions. For me, I was particularly attuned to the stories and specific recommendations David could offer as a local. He shared favorite restaurants and plenty of tips for having a more local experience, and we left more knowledgeable and confident that we could make the most of our time in the city. Free tours aren’t exactly free; although you don’t need to pay anything upfront to take them, all guides appreciate a tip at the end of the tour to compensate them for their time. Consider how much you might spend on a two-hour movie or guided tour to determine an appropriate value. We generally budget 10-15 USD per person when we take free tours, an outstanding value when you consider the amount of information you will learn and the opportunity you have to ask specific questions and get personalized information or recommendations. 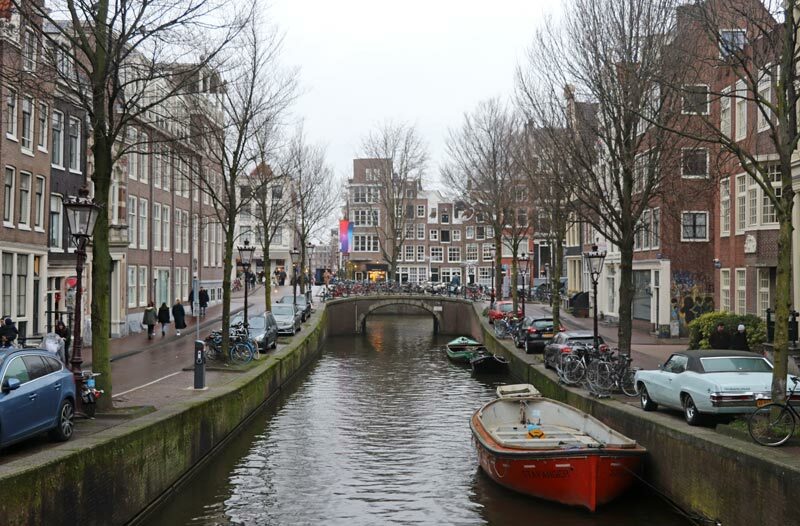 Amsterdam is sometimes known as the Venice of the North, and a big reason the city earned that distinction is because of the extensive canal network that runs through the city. Amsterdam is slightly below sea level, and its location on the North Sea contributed to its ties to the fishing industry and how the city was constructed. 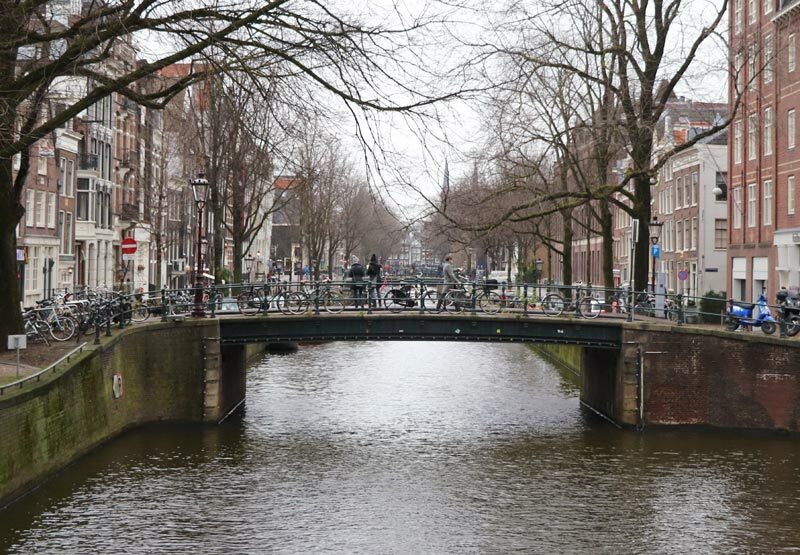 The canals were built in the 17th century, and today they are protected by UNESCO and a big part of the city’s landscape. You can experience this piece of history firsthand by taking a canal cruise; numerous companies offer them on long, flat, glass-roofed boats that navigate the canals at regular intervals. 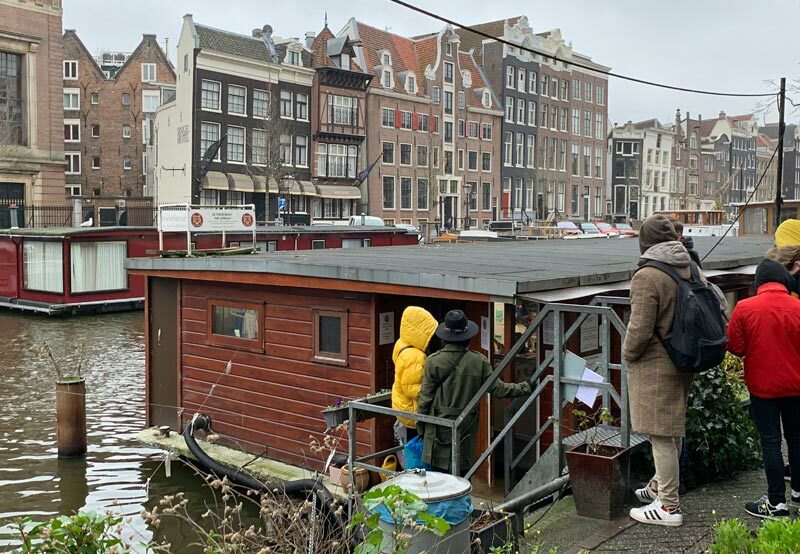 Canal cruises vary from simple hop-on, hop-off cruises (operating the way hop-on, hop-off buses do) to standard, narrated tours to elaborate experiences that serve dinner and drinks. 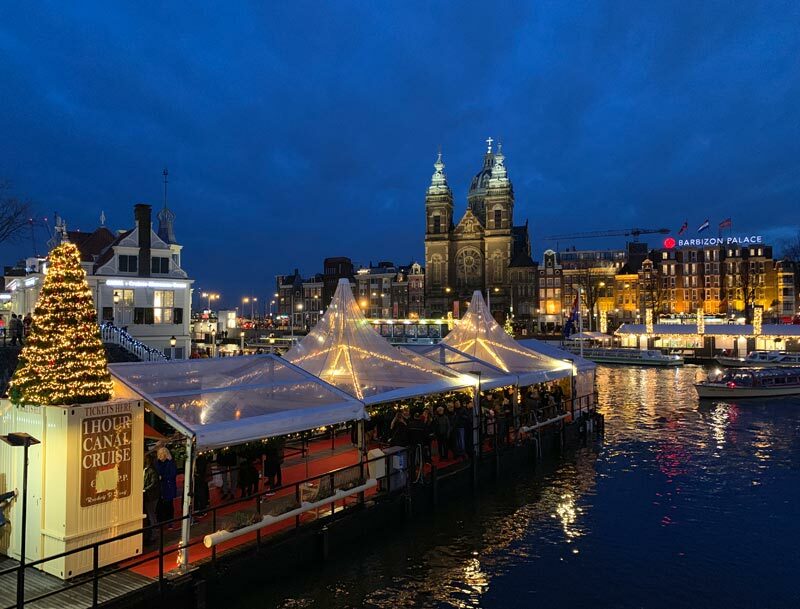 During the holidays, when Amsterdam is alight with festive holiday décor, some canal cruises operate routes that showcase the lights along a special itinerary. Book tickets in advance if possible, as canal cruises are very popular and the lines to buy tickets and get on a boat can be long without a reservation. One of the most emotional experiences you can have in Amsterdam is a visit to the Anne Frank House. Schoolchildren from around the world read The Diary of Anne Frank, the powerful words penned by Anne herself as she and her family hid in cramped quarters when Amsterdam was occupied by the Nazis during World War II. 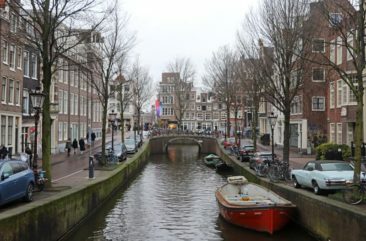 The book shares Anne’s experiences as a young Jewish girl whose adolescence was interrupted when her parents and sister, as well as another family, spent two years living in virtual silence so as not to attract attention to their existence in Amsterdam. Most people who read the book also know what happens after it abruptly ends: the Frank family was discovered by the Nazis and sent to Auschwitz, a Polish concentration camp. Anne and her sister Margot were moved to Bergen-Belsen in Germany, and they died there just months before the concentration camp was liberated. Of the eight people who lived in their annex, only Otto survived. 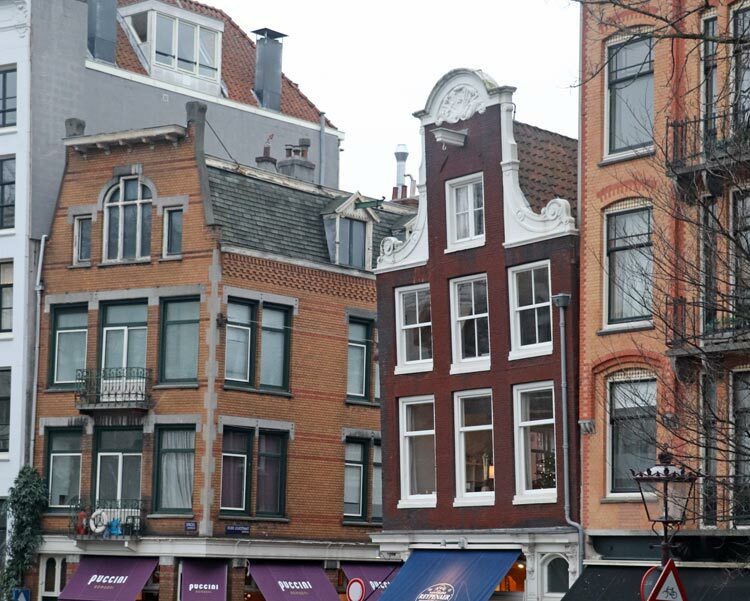 Today, the building where Anne Frank lived welcomes guests from around the world. In addition to an exceptional museum, you have the chance to walk past the bookcase that masked the door to the annex and see the handful of rooms made famous by Anne’s diary. Some spots, like the place on the wall where Anne’s parents marked her height as she grew, may leave you in tears as you consider the attempts made to make life as normal as positive. You’ll also see interviews with people who knew the Frank family as well as the famous diary itself. 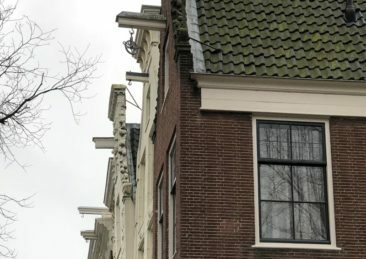 Whether you grew up reading the Diary of Anne Frank or whether you are curious about the heartbreaking impact World War II had on Amsterdam, the Anne Frank House is a museum you can’t miss. Cats traditionally hate water, but the homeless cats of Amsterdam happily accept it as part of life on De Poezenboot. Translated to the Catboat in English, for 50 years stray and homeless cats have been welcomed to live on the floating houseboat and animal sanctuary dedicated to giving the felines a safe, warm place to live. Visitors are welcome to stop in and spend time with the cats, each of whom seemed happy to pause for a scratch behind the ears and a few pats before slinking away for a snack or to curl up by the window. The Catboat is fully sustained by donations, so purchasing items from the gift shop or simply giving cash is a great way to ensure the cats continue to live well in the future. The boat is typically open for just a couple of hours in the afternoon each day (and the cats don’t entertain guests on Wednesday and Sundays), so there is often a short line before you can enter. Guests are allowed in to see the cats in small groups, so the houseboat never feels crowded. It’s a great way to get to know the cats and the Catboat’s admirable mission. We spent about 15 minutes playing with and petting every cat that wanted some attention (those who didn’t had plenty of spots to get away from the crowds! ), and it was the best 15 minutes we spent in Amsterdam. 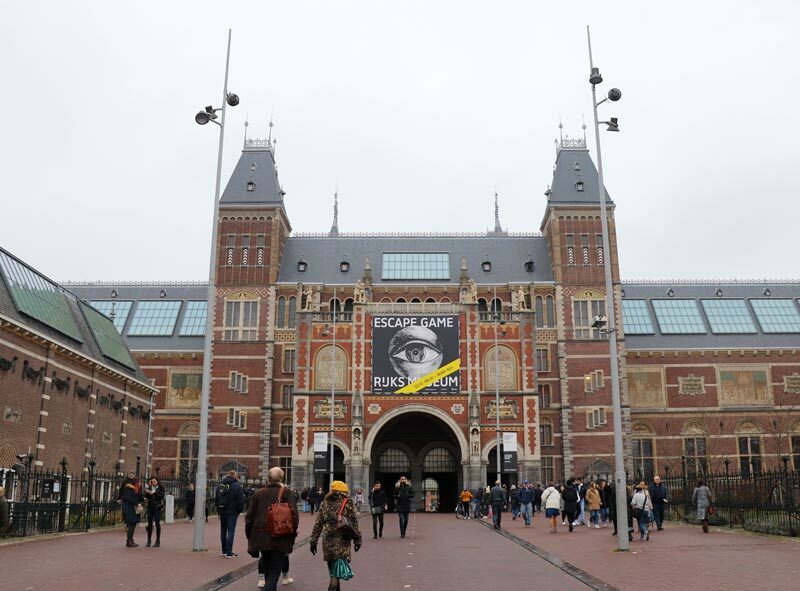 The Museumplein in Amsterdam is home to some of the city’s most prominent museums, and it’s a great place to spend an afternoon or a full day. Surrounded by green space, the area is a favorite gathering place for outdoor activities. 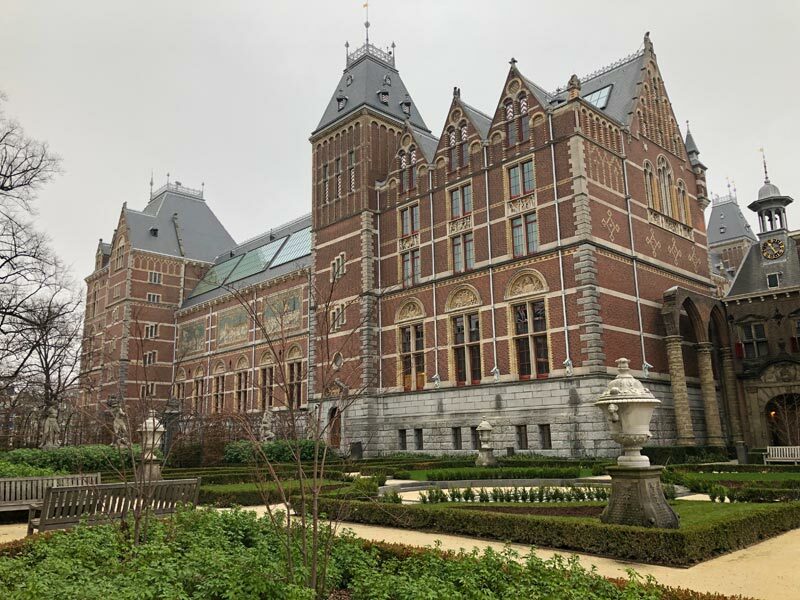 Perhaps the most recognized museum is the Rijksmuseum, which combines history and art to produce an unmissable Amsterdam experience. With more than 8,000 pieces on display in its collection, the Rijksmuseum is the largest art museum in The Netherlands. Visitors will find works by Rembrandt and Vermeer among many others; Rembrandt’s famous The Night Watch is among the most recognizable paintings in the collection. 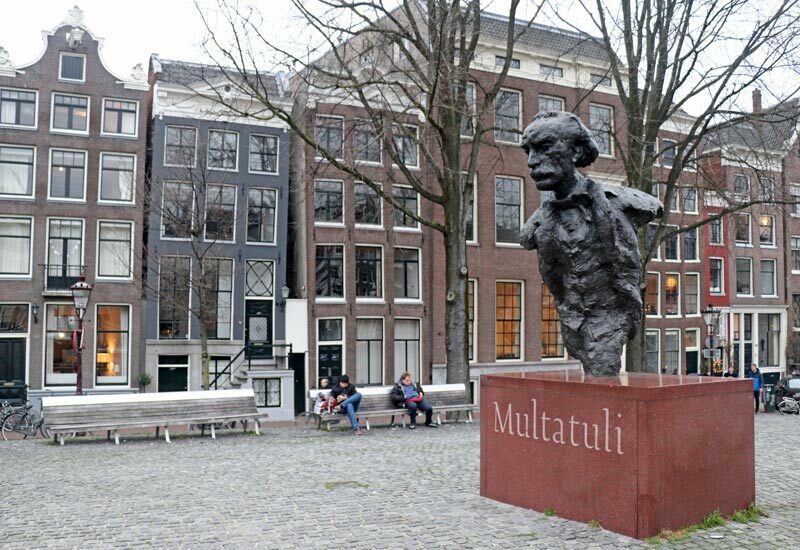 Also of note is the Van Gogh Museum, which houses the largest collection of the painter’s works in a single space. Van Gogh’s Self-Portrait and Almond Blossoms are two of the artist’s works on display, and they are two of his most famous. In 2017 the museum was the most visited museum in The Netherlands. Round out your visit to Museumplein by seeing the collection at the Stedelijk Museum, which is known for contemporary and modern art. You’ll find everything from sculptures to paintings to industrial design works on display, and with close to 100,000 pieces in the collection there is no shortage of items to view and admire. 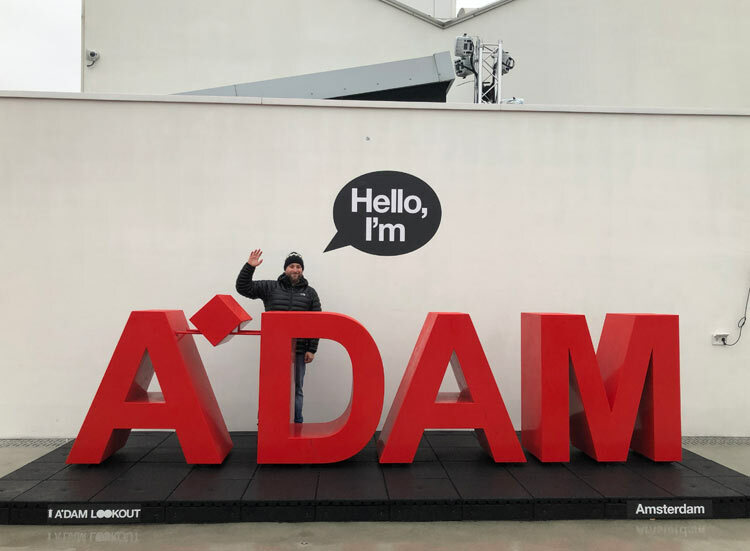 There was no way I could travel to Amsterdam with a guy named Adam and not visit the A’DAM Tower, but even if you don’t share a name with the 21-story building there is plenty to see and do to make a visit worthwhile. Adam had to get a photo here; it was calling his name! The A’DAM Lookout Tower is short for Amsterdam and Music (and, arguably, Amsterdam itself), a theme that plays out prominently throughout the building. Gibson, the famous guitar manufacturer, has office space there (something Adam, a Gibson guitar and bass collector, gleefully noted), and a large chair constructed of guitars and basses offers a unique selfie spot for tower visitors. Most people visit for the views, though, and for the cost of a ticket you can take a surprisingly fun elevator ride to the top of the building; if you look up you will see a light show that will entertain you during the quick 100-meter climb. Our visit happened to fall during a cold, hazy spell that dissipated a bit just before we left, but we still enjoyed walking along the top of the viewing deck and admiring the view below. Thrill seekers might enjoy the Over the Edge swing, where groups of two get a chance to sit in a swing that dangles them over the edge of the building. 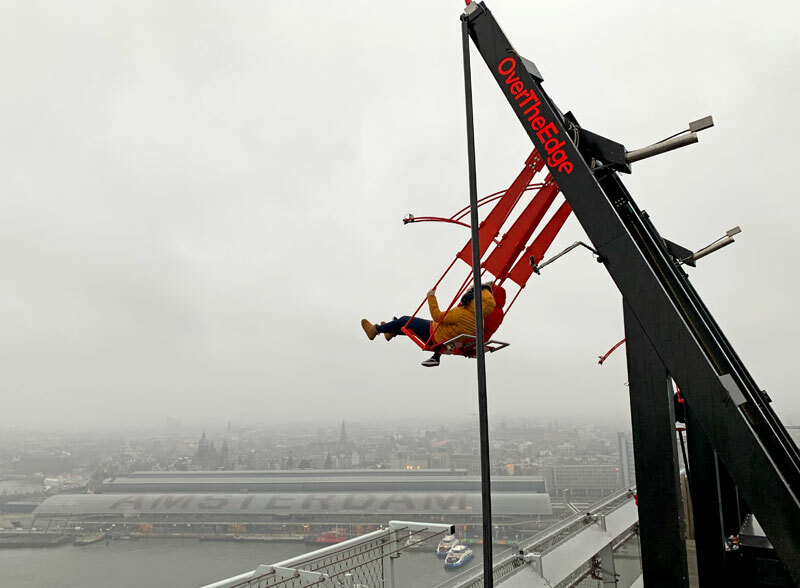 We skipped the swing due to the line and instead spent some time inside, where panoramic views surrounded us as we enjoyed snacks and a round of beers at the restaurant on the 20th floor. 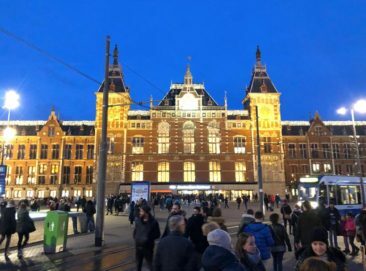 Getting there requires a brief, free ferry ride that leaves from Amsterdam Centraal, although it is accessible by public transportation as well. 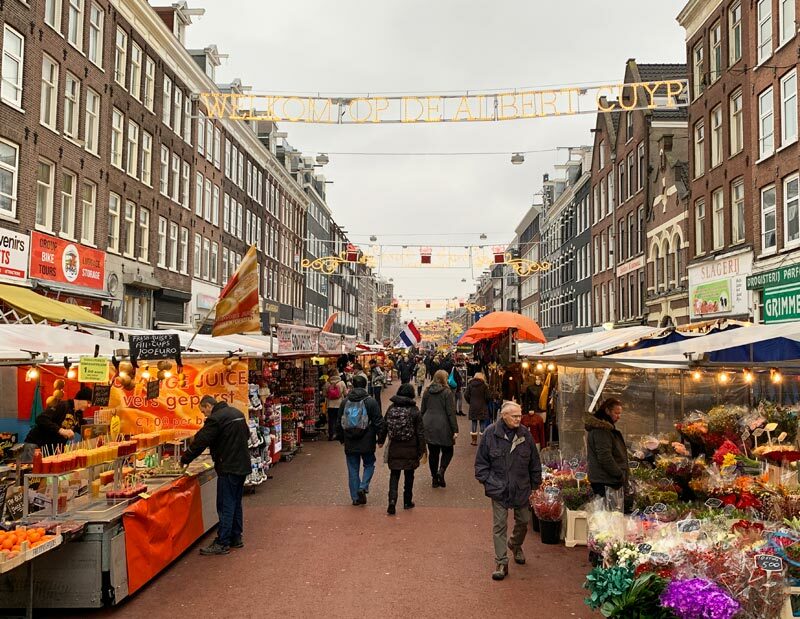 The busiest outdoor market in Amsterdam is the Albert Cuyp Market, and no matter what you have on your wish list there is a good chance you will find it sold by one of the many vendors. For more than 100 years the market has served Amsterdam, and it has grown significantly from a collection of pushcarts to a street lined by professional stalls that offer everything from fresh fruit to clothing to cosmetics and toiletries. Amsterdam is famous for its flowers, and several stalls had barrels overflowing with fresh flowers that all but shouted, “You are in Amsterdam!” as we walked by. 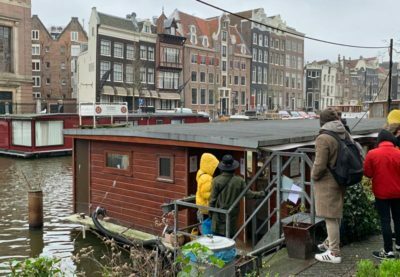 Still, the most authentic Amsterdam experience we could hope for was eating stroopwafels—an activity we did with great enthusiasm at the delicious Original Stroopwafel stand, located close to the market’s midpoint. We also enjoyed some fresh juices for just one Euro, which felt like a bargain and were perfect for sipping as we wandered the length of the street. Whether you need a souvenir, to pick up an item you forgot to pack, or you just want to appreciate the atmosphere of busy local commerce, the Albert Cuyp Market is a great item to add to your Amsterdam itinerary. 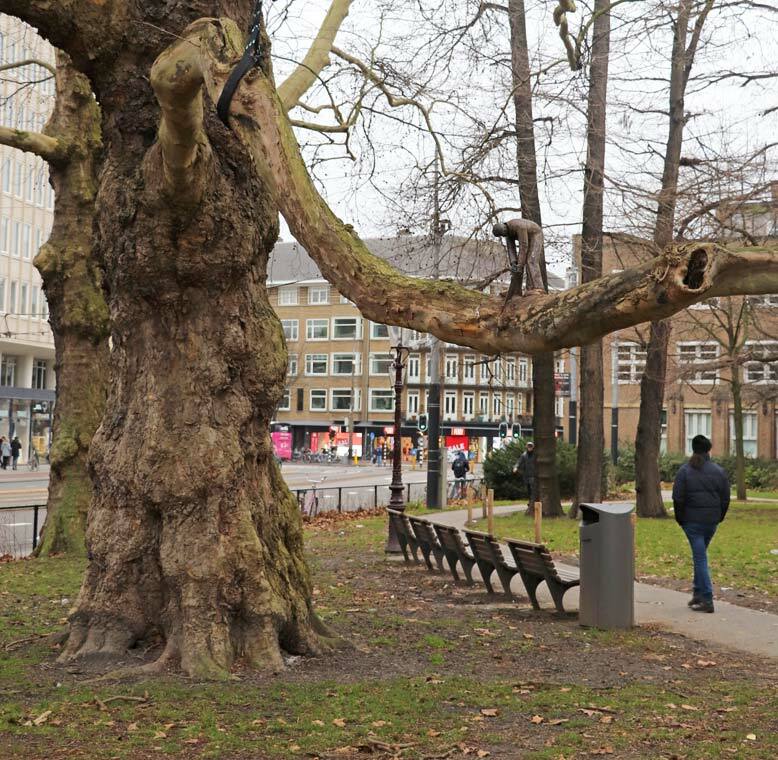 No one knows why the hardest working woodcutter in Amsterdam arrived in the city in 1989, but a visit to Vondelspark across from the American Hotel will give you the chance to see him for yourself. The little woodcutter is a tiny curiosity, standing just about 20 inches in height on a tree branch. He’s easy to miss if you aren’t looking for him, but he is easy to find if you are—and especially in the colder months when the leaves have fallen from the trees. 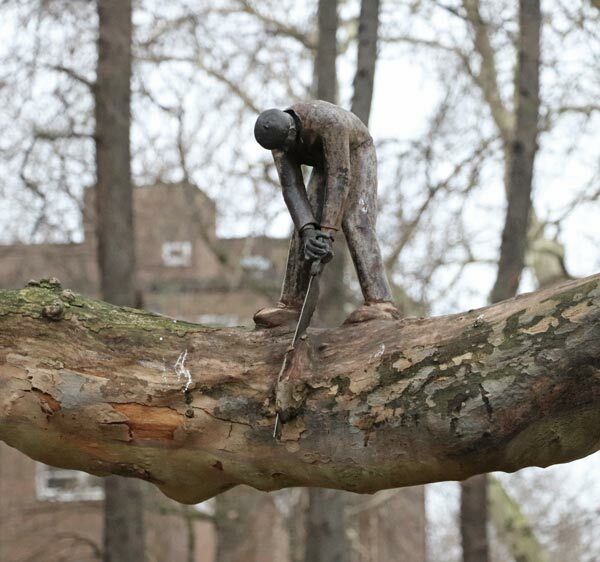 The Little Woodcutter has been in place for so long that the tree has grown around him, engulfing his shoes and part of his saw, which suggests he will be working away for years to come. 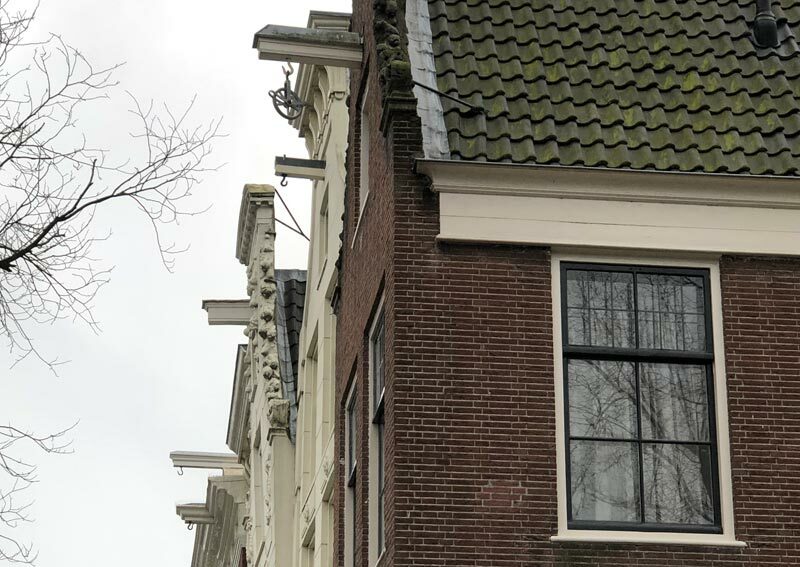 A walk through Amsterdam is a great way to explore and admire the architecture of the city, especially the beautiful trapgevel, or stepped gable, roofs for which the city is famous. While looking at the houses, though, you may notice some of them look just a bit unstable. Some houses lean to the side, and many of them lean precariously forward. Surprisingly, those design elements are either expected or intentional. Amsterdam is a pretty swampy city, and the houses built centuries ago use wooden poles to keep them sturdy and in place. The poles went through the clay and damp soil and into the sand below, which gave the houses some extra strength. Over time the wood rots, which can cause houses to slowly start tilting to the side. It is an expensive effort to replace the rotting wooden poles with new poles, these days made from stronger materials. In some parts of the city houses start to tilt but do not require additional attention; if the house is directly next to a neighboring home it can lean on, the house receives the stability it requires without additional modifications—and that explains why many tilting houses are inhabited and continue to dot the landscape. Another curiosity in the cityscape are houses that tilt forward—and those are part of the city’s history, too. During medieval times the houses were built to tilt forward to ensure rain water didn’t flood the homes from the top floor down. Even more recently, when Amsterdam served as a major shipping port, goods that were delivered to the city were often stored in attics. Most buildings had hooks at the top, and when items were hoisted up using the hooks they would not come in contact with the buildings that tilted forward. Today, many buildings still tilt forward for that reason—and if you look up, you will still see plenty of hooks that continue to be used by residents who can’t fit their belongings through their home’s tiny, steep staircases! 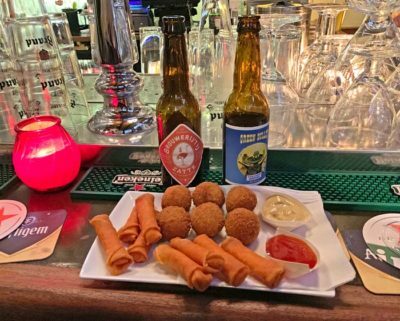 Bar snacks are important in a city that prides itself on its beer, and bitterballen are about as local a snack as you can find in Amsterdam. Described by several bartenders as fried meatballs, we found them to have a consistency closer to that of mashed potatoes. Either way, the deep-fried treats are crunchy on the outside and creamy on the inside, and the ground beef makes them a savory and filling snack. Like a thin, fried cheese egg roll, kaasstengels are a delicious, crunchy appetizer found at bars throughout the city. Danish cheese is wonderful, and paired with a side of chili sauce and cold beer it is an experience you may want to repeat every night of your trip to Amsterdam! Amsterdam has a lively beer scene, and you’re never far from a seriously good brew. Amsterdam is home to some internationally-known beers like Heineken and Amstel, but you will be well-served to try some more local beers when visiting the city. 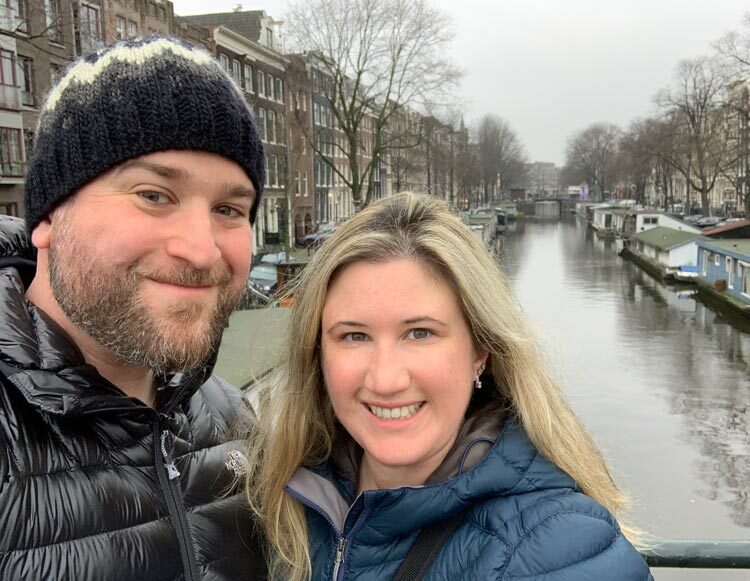 A few of our favorite were the American IPA-style Green Bullet from Two Chefs Brewing and the Brouwerij’tij Zatte, a Belgian-style tripel, both recommended to us by a local bartender and both perfect for capping off a full day of sightseeing. During my first trip to Amsterdam I stumbled upon a food truck that served stroopwafels, and although I didn’t know what they were I ordered one at a tour guide’s insistence. I watched in awe as the cook poured batter into a waffle iron and, once it was cooked, sliced the thin waffle in half. He filled it with gooey caramel before pressing the two halves together and handing it back to me. It was love at first bite, and during our most recent trip to Amsterdam I made it my mission to try stroopwafels whenever we could find them. You can find them everywhere, especially in collector tins or wrapped in plastic for easy transport, but the best stroopwafels are made fresh right in front of you. 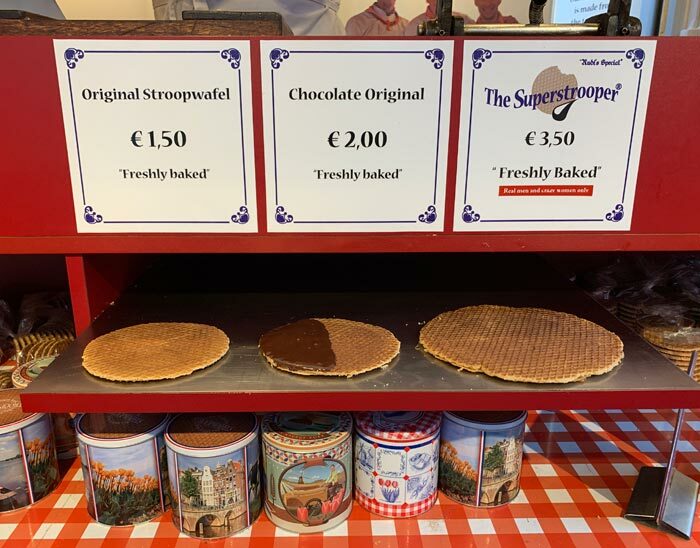 If you are looking for a classic, no-frills stroopwafel, visit the Albert Cuyp Market and the Original Stroopwafels cart. For just 1.50 Euro you’ll have a freshly prepared stroopwafel in moments (and if there is a line, they are worth the wait!). 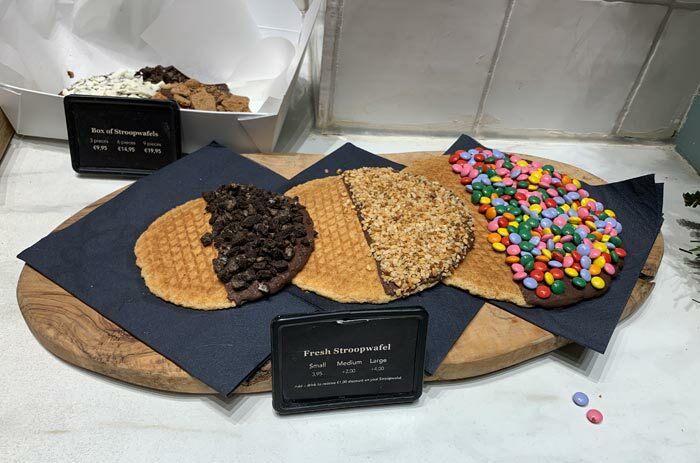 You can also order the Stroopertrouper, a super-sized stroopwafel, if you are feeling particularly hungry. If you want to try an upscale gourmet stroopwafel, van Wonderen Stroopwafels on Kalverstraat is a great destination. Thin waffles and caramel meet delicious topping choices like M&Ms, Oreos, hazelnuts, and crunchy cookies. Stroopwafels are available in three sizes, but most people seemed to order the largest—and there didn’t seem to be any regrets after taking a bite! Thinner than American-style pancakes but thicker than crepes, Dutch pancakes are a must-try meal when visiting Amsterdam. Pancakes range from sweet and fruit-topped to savory with meat, cheese, or fish baked into them. The pancakes are usually enormous, covering a dinner plate, so it’s a good idea to bring your appetite to the table. 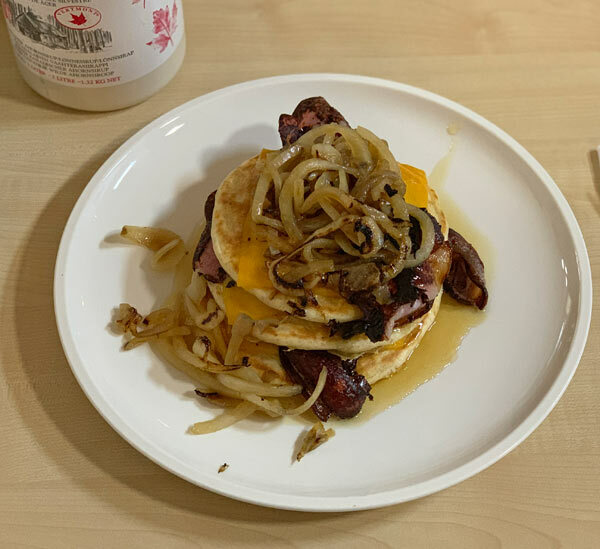 We stopped into MOAK Pancakes because it was close to our hotel and open for breakfast, and our meals were delicious. MOAK serves something closer to American-style pancakes, but with plenty of fruit, sweet, and savory toppings there are plenty of combinations for everyone. It’s a great breakfast spot and a fun place to eat when in Amsterdam. This gem of a bar in the Jordaan neighborhood serves borrelhapjes (appetizers like bitterballen and kaasstengels) as well as tons of draft and bottled beers. A truly charming, local spot, we were among the only people there who didn’t personally know the bartenders—although we received exactly the same service. The bar has a very homey feel, and we especially loved the cat that slept near us for most of our visit, awaking only when some noise from the billiard room merited further investigation. 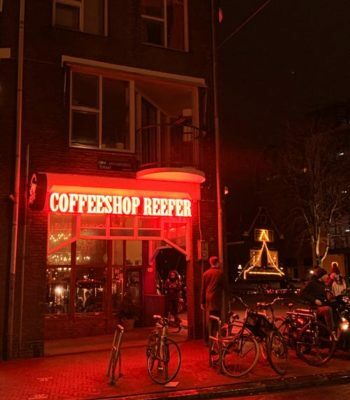 There is a big difference between coffee shops around the world and coffeeshops in Amsterdam. 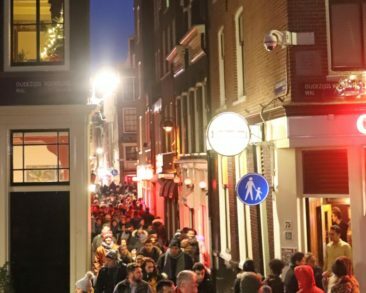 Most visitors already know that Amsterdam is a very tolerant city, and marijuana is a part of the city’s permissive fabric. When you see a sign for a coffeeshop, it signifies a place where you can smoke pot. Marijuana is not legalized in The Netherlands, but culturally the policy of tolerance governs most activities; that means smoking pot is incredibly common. Chances are you will not mistake coffeeshops for cafes that actually sell coffee, as coffeeshops emit a smell that cannot be mistaken for anything other than weed, but be sure if you need an afternoon caffeine fix you don’t accidentally walk into a coffeeshop instead! The Red Light District is a famous Amsterdam spot for people curious about the city’s history with prostitution. 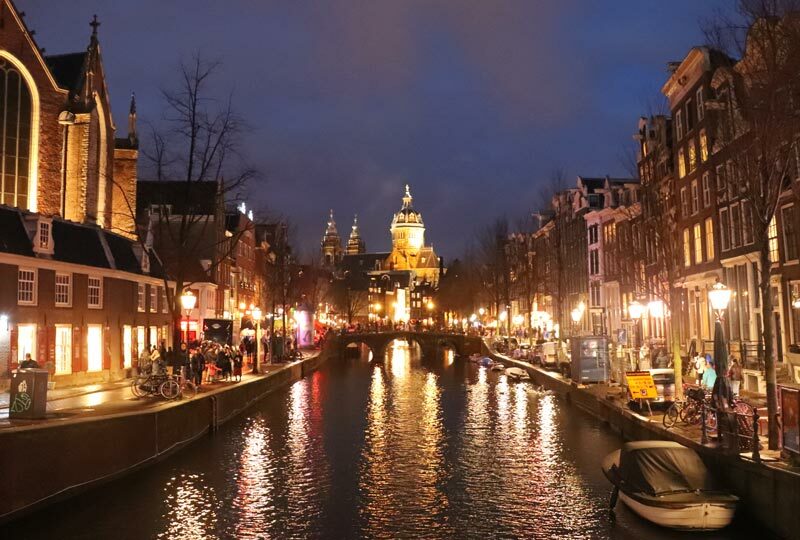 A walk through the Red Light District after dark will guide you past more than 100 small glass windows with women in seductive poses and clothing. If the red light is on, the women are available to entertain clients; if the curtain is closed, they are with a client. Prostitution is legal in Amsterdam. The women work as freelance professionals and are part of a union, and although it may be tempting to take photos because prostitution is not always such an open part of the culture elsewhere in the world, it is best to avoid taking pictures. 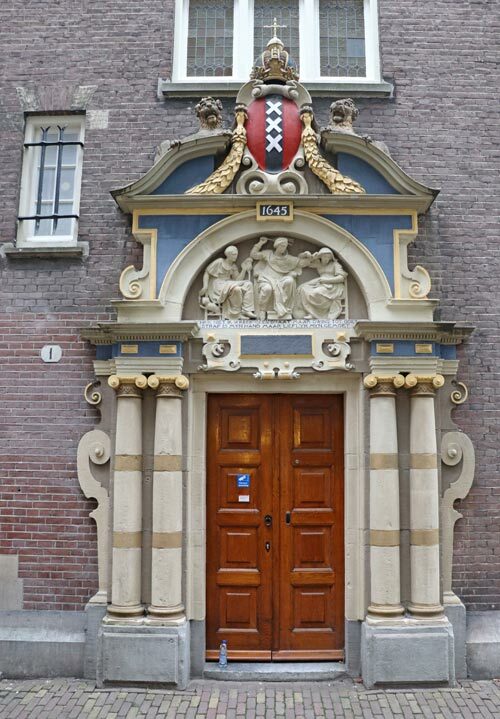 Whether you support prostitution or not, the women in the Red Light District are legally working, and it is not appropriate to photograph them. 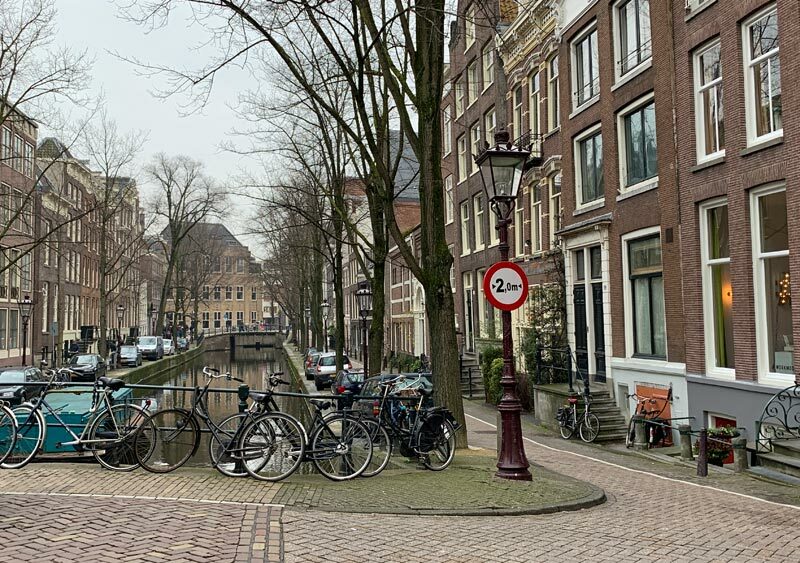 Still, walking through provides more clarity about what happens in the Red Light District if you are curious about its connection to the city. With dozens of hotels and hostels throughout the city, there is no shortage of lodging options in Amsterdam. We chose to stay at the Holiday Inn Express Amsterdam – City Hall, which is just a 15-minute walk from Amsterdam Centraal (the main train station) and walkable to just about every site in the city; in fact, we never used public transportation or bicycles while we were there because it was just as easy to walk. The Holiday Inn provided us with a great stay; our room was clean, quiet, and comfortable. We also appreciated the included breakfast (especially when leaving for an early train to Bruges). If you are looking for a hotel in Amsterdam, Booking.com connected us to the hotel that worked best for us—and they likely have a great option for you, too! 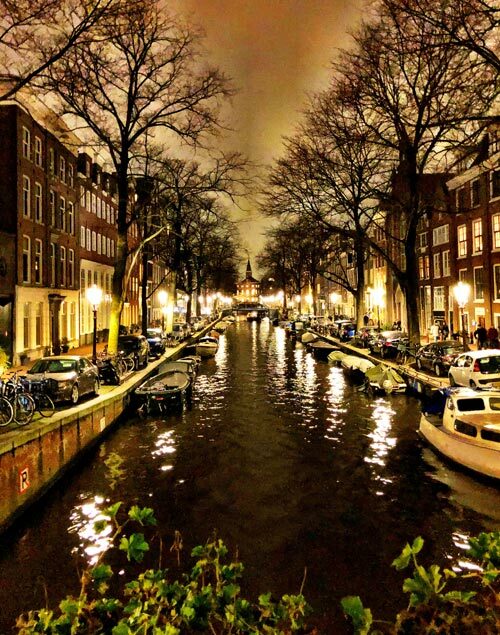 No matter what you are looking for in a vacation, Amsterdam most likely offers it. From its historical relevance in Europe to delicious local food and beer to a quiet morning walk to see the architecture, Amsterdam is a beautiful place to visit and a great city to include on your next European vacation—or simply a destination on its own! 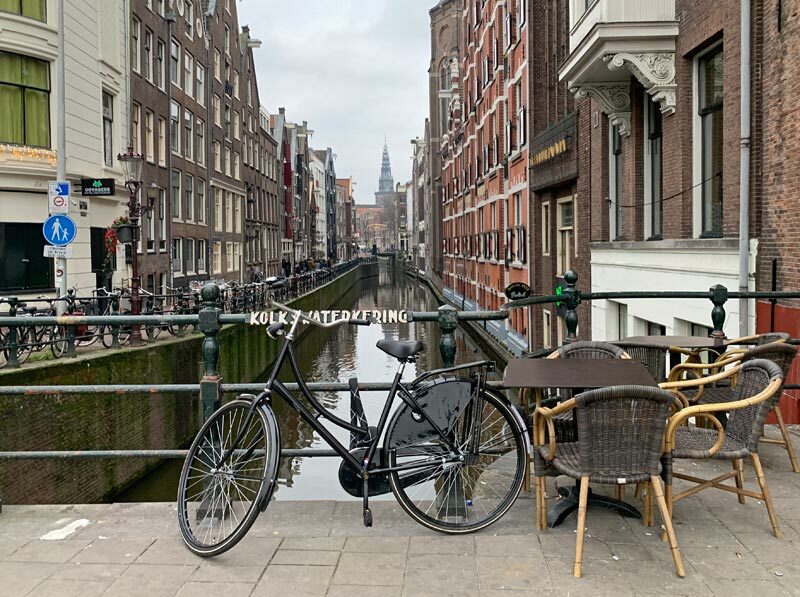 Leave a comment below and let us know if your travels take you to or through Amsterdam, and let us know what tips you would share about visiting the city. If Amsterdam is in your vacation plans, have a stroopwafel for us! Looking for more fun cities to visit around Europe? Here are a few more posts for inspiration! * From time to time, our travels are directly impacted by a service or company. 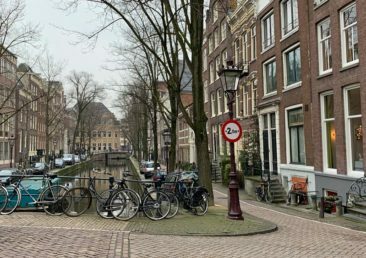 In this case, we visited multiple locations in Amsterdam on our own and as part of a walking tour, and this post includes our candid review of our experience. We selected these locations and companies based on our own research and travel needs; we were not offered and did not receive compensation of any kind from them or any other party in exchange for our review. Learn more about our travel philosophy here.